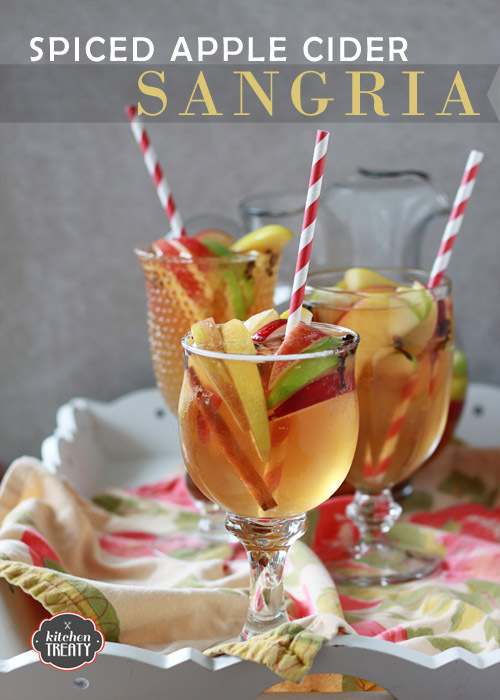 This sweet spiced apple sangria is nice and light, a little bubbly, a tad sweet, and an absolutely perfect excuse to celebrate the season. I’ve decided to try a slightly different angle this year when it comes to winter: I’m going to fully, enthusiastically embrace each phase of the season as it comes. Rainy but mild? We’re donning raincoats and wellies and heading out to splash in puddles. Dark and dreary? Time to haul out the big blanket and cuddle in front of the fire. Thanksgiving, Christmas, Valentine’s Day, Saint Patrick’s Day … there will be crafts to make, books to read, events to attend. A snowman will happen, and hot chocolate afterwards. And, of course, recipes to make for every season. Lots and lots of recipes. Several of which – let’s be honest – will be cocktails. 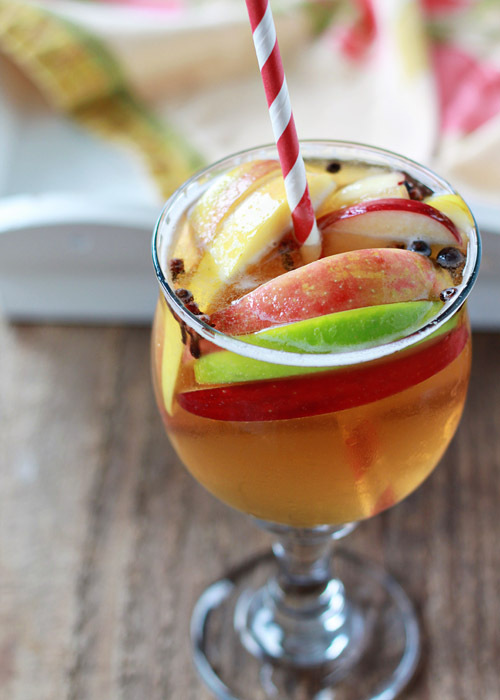 My new outlook – okay, yes, and maybe a glass or two of, say, this Spiced Apple Sangria now and then – will help me to forget the fact that we will likely go for months without a peek of sunshine. It will help to make the three-week-long stretch of gray and drizzle come January more palatable. 16 hours of dark per day? No vacation to a sunny destination on the calendar?? Not a problem! Man. Dark and gray. For the next five months. Um, yeah. 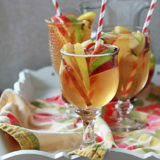 Get me another glass of apple sangria. Stat! Yeah, winters can be tough, especially in the Pacific Northwest. But you know what? I actually am kind of excited for it now. In the immortal words of Patti LaBelle, I’ve got a new attitude! And – AND! 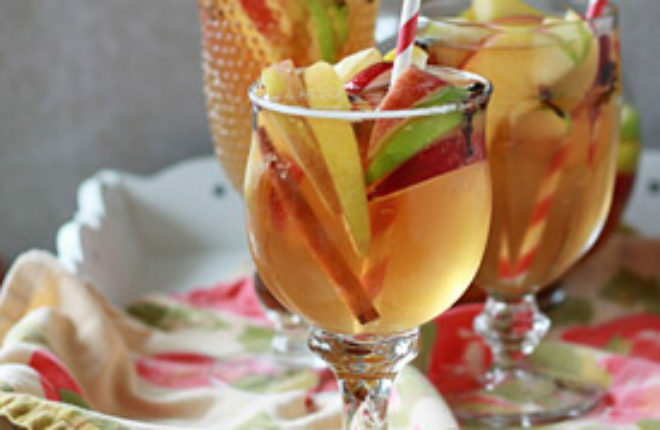 A new apple sangria recipe. Add all ingredients except ginger ale to a 2.5-quart or larger pitcher. Cover with airtight lid or cover tightly with plastic wrap and refrigerate for at least 4 hours, up to 24 hours. If desired, remove fruit and pour mixture through a fine-mesh sieve to strain out the spices and orange peel. Discard spices and orange peel and return liquid and apples to the pitcher. Personally, I like having the cloves and allspice bob around in each glass, so I don’t strain, but you do have to be careful to dodge the whole spices when drinking it. Pour liquid into glasses about halfway. Add apple slices until glass is about 3/4 full. Top off with ginger beer. Serve with a straw. Man does this look good. I love the addition of ginger beer. And cute straws too! What could I use in place of the liquor? There are members of my family who do not drink alcohol.